For quite a while now, we’ve been sitting on a Buy One Get One offer from Old Burdick’s. They’re not real hard to get. They seem to be printed on the back of every ticket for sporting events in Kalamazoo. We’ve actually got a handful of them, but the one I put away to use someday was a ticket from a football game at WMU last fall. We’ve already been to Old Burdick’s downtown, so I wanted to give the west side location a shot. 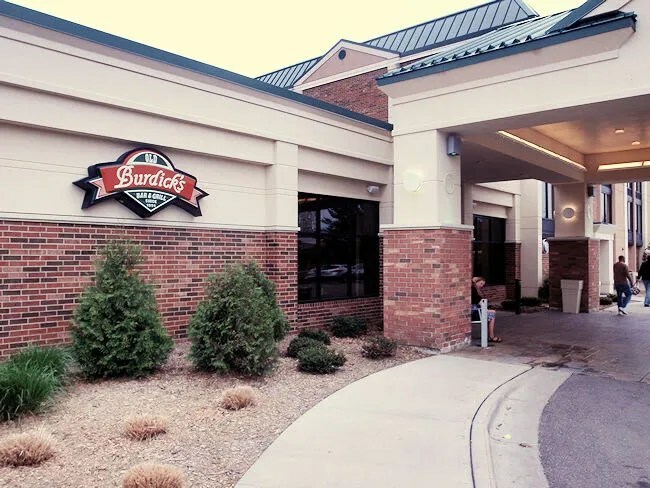 Old Burdick’s West is inside the Holiday Inn on 11th Street in Oshtemo Township. The hotel can be a little hard to find even though it’s clearly visible from US-131. When you turn the corner on to 11th Street from Stadium Drive, there is a sign that tells you turn in 500 ft. If you pay attention, there is another smaller sign and a left turn lane to get onto the access road to the hotel. Luckily, J had stayed at that hotel before we moved to town so she knew it could be easy to drive right by. The restaurant is just past the registration desk when you enter the main door of the hotel. You walk down a long hallway that separates the bar area from the pool before you come to a hostess station. Past the hostess station is the main dining room where you have a wonderful water view. No, there’s no lake or river running by the property. You’re actually looking at the hotel’s pool. I kid because it’s really not that bad. We just both got a chuckle out of it, but it looks like you can get service out on the patio. I saw a couple servers bringing drinks out there. Man, my parents would have loved that. We always used to stay in Holiday Inn’s and this looks like one of those that was/is a “Holidome.” We loved the Holiday Inn for that reason. Anyway, back to dinner. 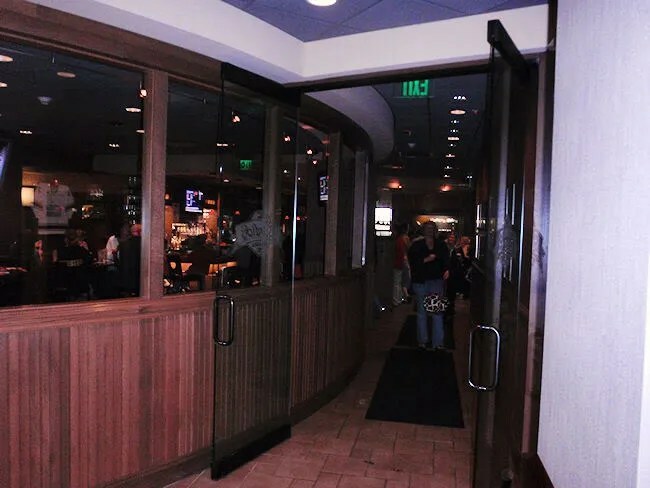 We were seated at a booth in the dining room that looks a lot like the dining room at the downtown location. The place was pretty packed with a lot of large groups. There must be a soccer tournament or something this weekend because there was a lot of large groups with multiple kids. There were also large groups of older people. We were probably one of only a couple couples, but if I was staying at the hotel, I would love to have a restaurant like this available. When the waitress came to get drinks, we asked her what qualified as an “entree.” She told us pretty much anything but dessert. If we wanted Buffalo wings as an entree, we could do that. We just couldn’t have cheesecake for a meal. We start with two Oberon’s while we looked over the large menu. I was tempted by some of the pasta entrees but have a hard time bringing myself to order pasta at a restaurant. Since we were getting one of our meals free, I decided to go all out. Well, all out for me. 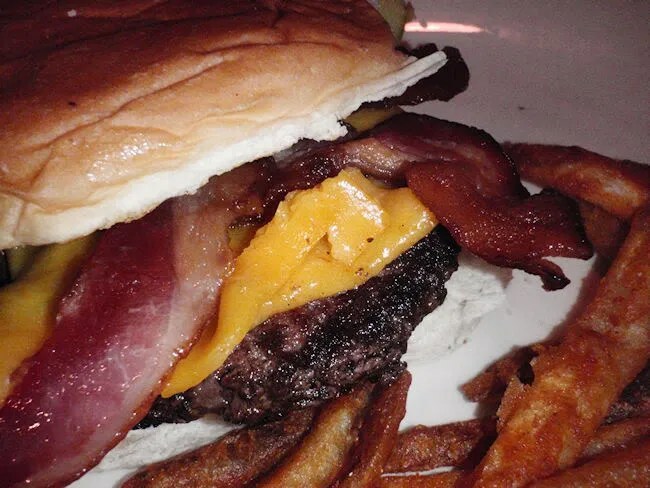 I ordered the Kobe Beef Burger with cheddar cheese and bacon. Oh, how I love Kobe beef. I wish I could afford it in steak form, but I’ll take it as a burger. The Kobe Burger at Old Burick’s is a 1/2 lb of meat grilled over an open flame. It had such a delicious flavor from the grill that mixes with the juicy, bold flavor of the Kobe. The bun is what really surprised me about this sandwich. At first glance, it looks like a super market bun, but it’s actually made by Renzema’s Bakery in Kalamazoo from the original 1911 Burdick’s Hotel recipe. While it may not look like much, it was actually very soft and had a little bit of a toast to it. As far as simple buns go, this one is a good combination of tradition and flavor. J ordered the Smokehouse Wrap. 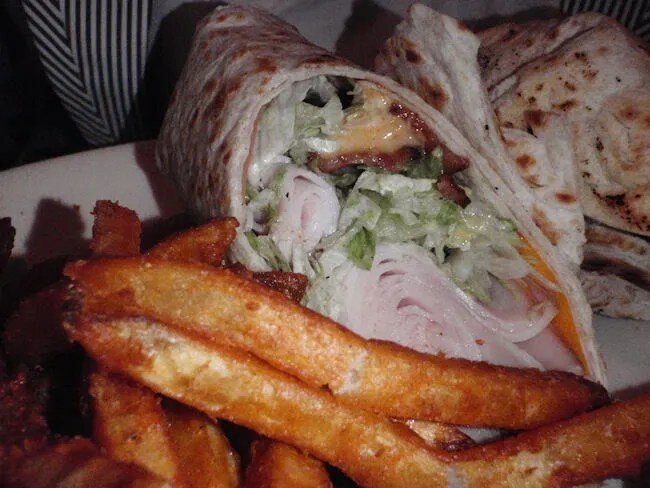 The flour tortilla is filled, and I mean filled, with smoked turkey, smoked cheddar, applewood smoked bacon, lettuce and a spicy mayo. J was very surprised by the amount of meat. When I makes sandwiches, I use a lot of meat and this wrap had more meat than I use. Usually, this is a turn off for her, but the turkey had a really great smokey flavor to it. She only pulled out a tiny sample for me to try. I liked that the turkey was warm so even though she ordered a cold meat sandwich, it wasn’t cold. Both of our sandwiches came with fries which we both liked. The fries are fried in a seasoned beer batter. I think J got more than I did, but she shared. Our bill was just under $20 which is amazing considering we both got beers and I got a ten dollar burger. We were also in somewhat of a hurry because we needed to get somewhere. We walked in by 5:45 and were gone by a little after 6:30 which gave us plenty of time to keep that 7:00 appointment despite the fact they were pretty busy with large groups. Old Burdick’s West didn’t disappoint. All the things we liked about the downtown location were present at the west side location and we got our meals much faster. 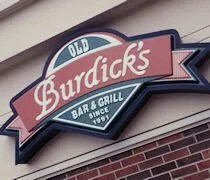 I’ve stayed in plenty of hotels over the years and it’s not very often you find a restaurant like Burdick’s. You really should though. old burdicks worst brunch I have ever been to in my 69 years. Total rip off. Food was bas and cold.